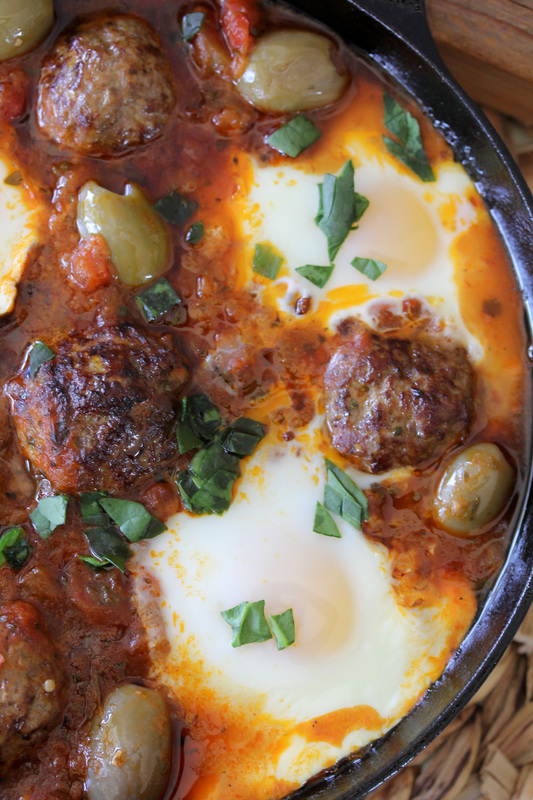 Whole30 compliant Shakshuka + Moroccan Spiced Meatballs from the Whole Smiths. 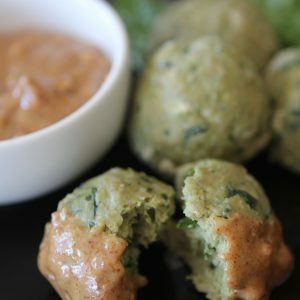 An easy-to-make paleo and gluten-free recipe that can be easily added into your weekly meal plans on a regular basis. Shakshuka. Say it with me now, shak-shu-ka. It has a nice ring to it, doesn’t it? It kind of just rolls off the tongue. Shakshuka. It’s fun to say and the even better news is that it’s a super healthy and easy dish to add into your weekly rotation. In this version, I make it even easier by using Mina Shakshuka Sauce which is Whole30 compliant. 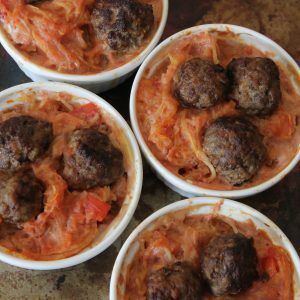 I also decided to add some additional protein to this recipe in the form of meatballs. While a traditional shakshuka has eggs as it’s main protein source I figured I’d up that and add some meatballs as well. And can I tell you, these meatballs are to die for. I kept eating them while I was making the dish. I’m lucky there whereby left for photos. I recommend making them in a cast iron skillet to get an extra good ‘do on the outside. While I finished this post last week, I’m editing this bit in to add a note about my trip to Expo East last week. It seems quite appropriate for this post. In case you are unfamiliar with what Expo is, in short it’s a giant trade show for all sorts of natural products, mostly food. While “natural” tends to be a catch all for a lot of things, the number of companies truly making clean products makes my heart sing. As you know, I strongly feel that the future of our diets and food system lies in creating clean foods that are convenient and accessible to us. 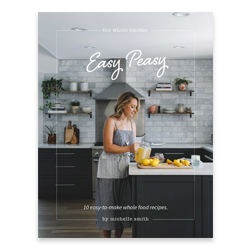 Sure, making homemade everything with produce fresh from our garden every day sounds amazing, but how realistic is that for us in our busy lives? 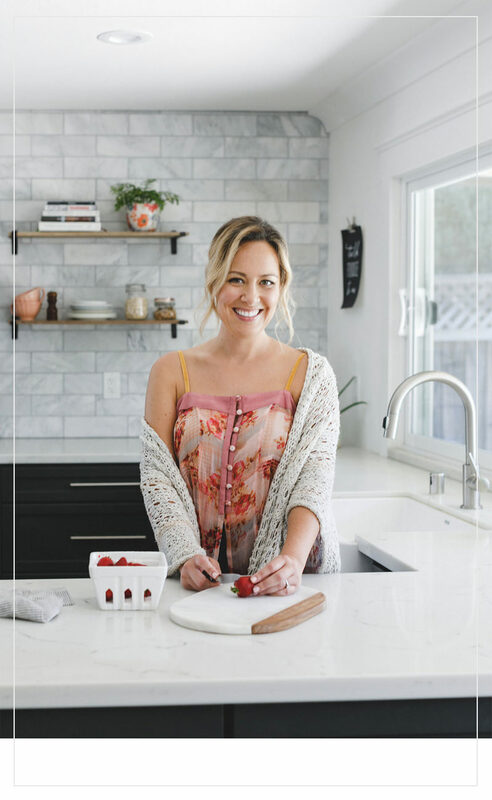 When a company can make a product that provides good, clean ingredients and saves us time in the kitchen eating well becomes that much easier. 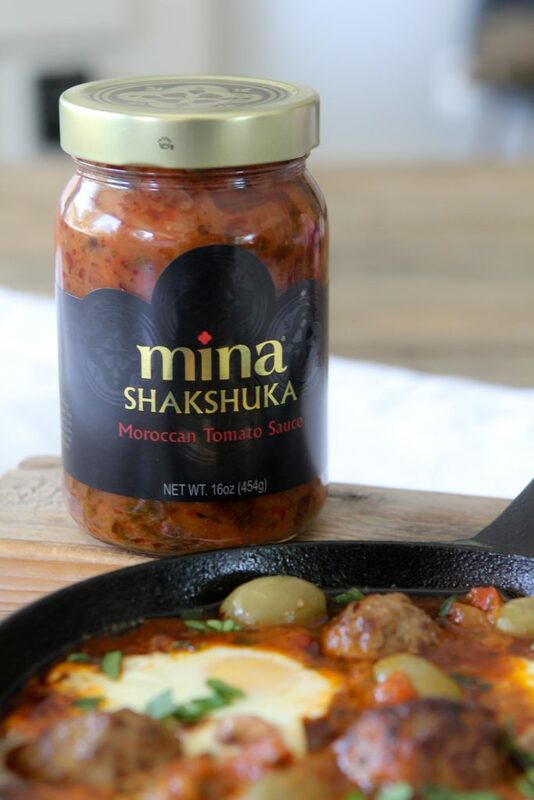 Which is part of the reason I am loving this Mina Shakshuka Sauce (and all of their other products for that matter) so much. To be able to add this flavorful sauce to a pan and have a quick, healthy meal ready with minimal effort is huge. Not to mention this shakshuka sauce is better than any that I’ve made at home on my own. 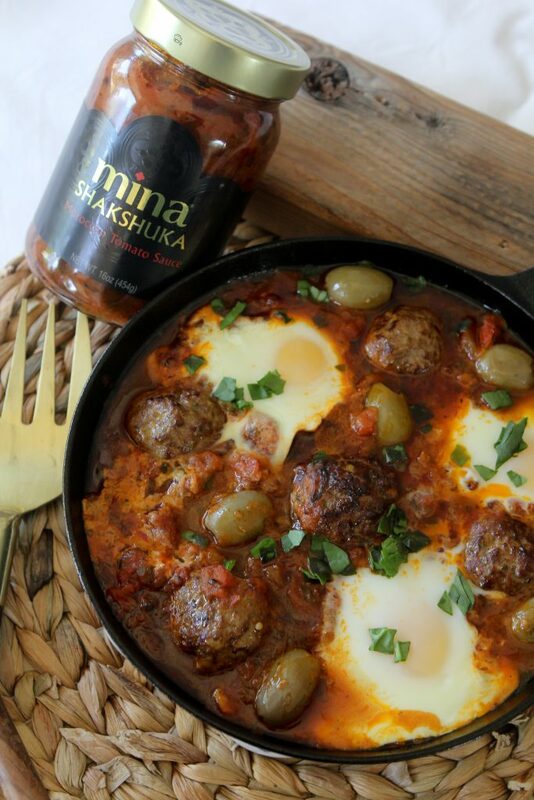 The team at Mina nailed the spice factor on this shakshuka sauce for sure. It has just a touch of heat and is enough to make me happy but not spicy enough that the kids wouldn’t eat it. As well, they even use olive oil in their shakshuka sauce and not other types of unfavorable oils which is amazing. Anyways, when we have plenty of healthy, accessible, convenient and delicious food options on hand our food system and diets will be a much better place to be. And it’s happening. Companies like Mina and others are part of that change and for that I am so thankful! Back to the recipe! 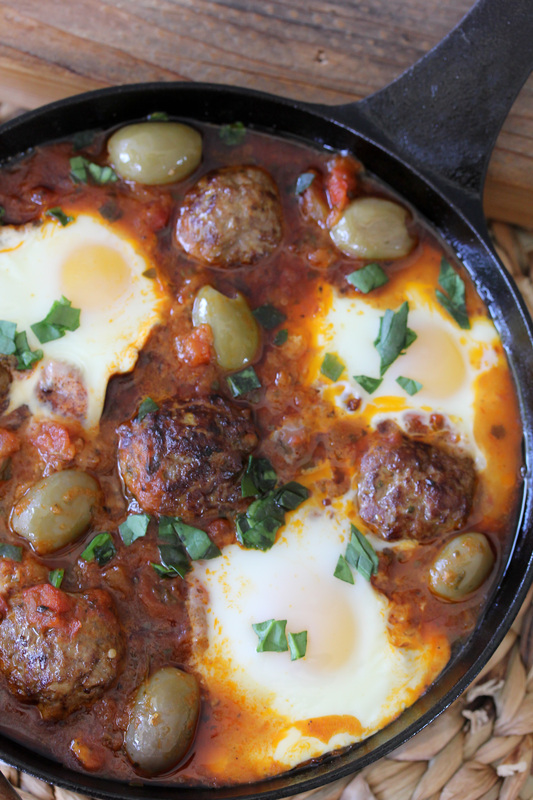 I also added some green olives to the shakshuka because everything is better with olives. Right? Unless you’re one the the crazy people that don’t love olives. But that’s another story. And I guess olives wouldn’t make ice cream better. But wait! This reminds me of a story. Back when I was 10 or 12 Full House was one of my favorite shows. (Ok, fine. It still is. And Fuller House is this 37-year old’s new favorite.) In one scene Michelle was charges with making Uncle Jesse a meal and she prepared him something with olives, cheese and ice cream. And you know what? I loved olives and cheese so much that I thought it sounded good. I didn’t understand what exactly was so gross about this situation. I mean, olives and cheese aren’t all that far off are they? And yes, now as an adult I see the ice cram as… strange. But at the time I was like serve me up a bowl of this Michelle Tanner! I digress. 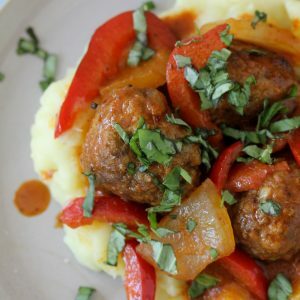 If you’re looking for an easy weeknight meal this Whole30 Compliant Shakshuka + Moroccan Spiced Meatballs recipe will fit right into your healthy meal plan. You can find Mina products at their website, Amazon and some Whole Foods locations. 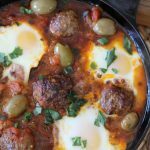 Whole30 compliant Shakshuka + Moroccan Spiced Meatballs from the Whole Smiths. 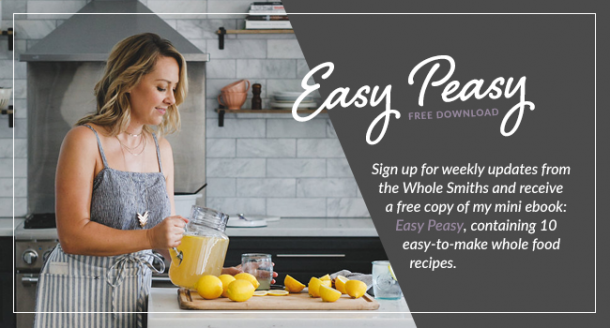 An easy-to-make paleo recipe that can be easily added into your weekly meal plans on a regular basis. Add the ground beef, salt, cumin, smoked paprika and dried parsley to a bowl. Combine the ingredients together throughly using your hangs until all of the ingredients are well incorporated. Form the ground beef into 1[1/2] inch balls. Add the coconut oil to a cast iron skillet (any skillet or pan will work but cast iron rocks) and heat over medium heat. Once the oil is hot add the meatballs (you may have to do a couple of batches) and cook each side for two minutes until the meatballs are cooked through. 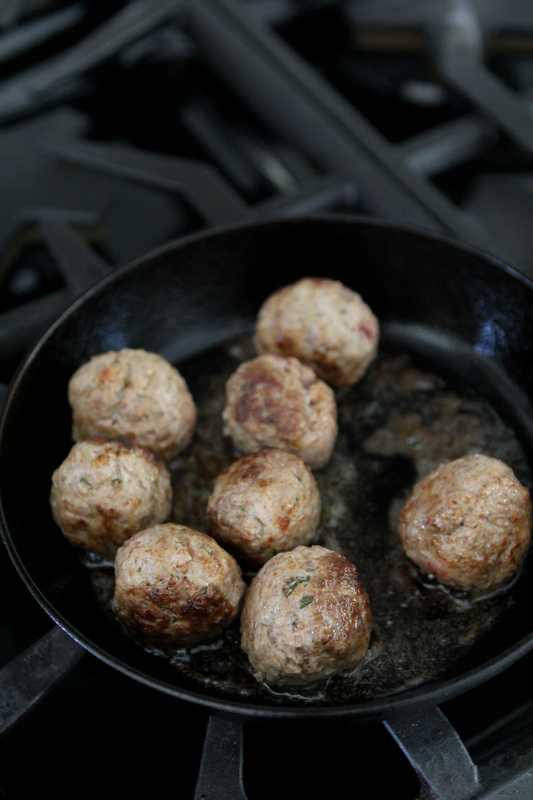 When all of the meatballs have been cooked, remove them from the pan and drain out most of the liquid. 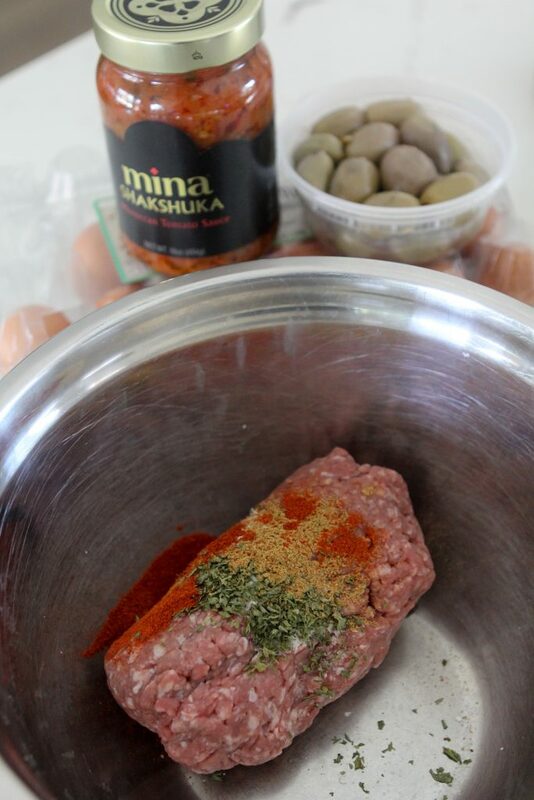 Pour the Mina Shakshuka Sauce into the pan and nestle the meatballs into the sauce. Make 4 small wells in the sauce and crack an egg into each. Nestle the olives into the sauce where there is space. Bake the shakshuka for 20 minutes until the egg whites have cooked through. Do you know of a good clean sauce recipe I could make since I cant find it at my local grocer?